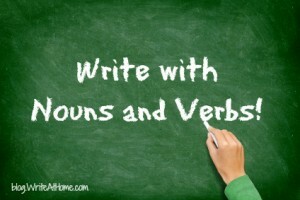 Home / Blog / Write with Nouns and Verbs! Nouns form the skeleton of all writing. Without nouns your writing would sag to the floor like a spineless mass of skin and flab. Perhaps it is because nouns are so simple and obvious that young writers don’t pay enough attention to them, but strong, specific nouns are the most visible element of writing. Wise writers give careful thought to every noun. There are two kinds of nouns. Nouns that name ideas, feelings, and concepts are called abstract nouns. Examples of abstract nouns are, knowledge, anger, individuality, and hunger. Nouns that identify persons, places, and things are called concrete nouns. Examples are: Kobe Bryant, pogo stick, and spaghetti. Good writers need a tool box full of both kinds of nouns, but remember the importance of showing over telling. People can’t see homelessness, but they can see cardboard shelters, trash can fires, and bag ladies. People can’t see relaxation, but they can see a porch, a hammock, and a glass of lemonade. Concrete nouns, therefore, ought to outnumber the abstract. The key to great nouns is specificity. If the postman faces a dog on the porch, it matters whether it is a Chihuahua or a Doberman. If a father allows his teenager to drive his car, it matters whether it’s a sleek sedan or a rusty station wagon. To make the image as vivid as possible, be as specific as possible in your choice of nouns. WriteAtHome: We Teach Writing So You Don’t Have To! If nouns are the skeleton of a composition, verbs are the muscles. Verbs make a piece of writing move and breathe. Pay careful attention to the verbs you use. The verb selections you make will mean the difference between plain, placid prose and compelling, colorful compositions. The car went down the street. Went? Yuck! There is no blander verb in the dictionary. What does this sentence tell us? Very little, of course. It gives basic information about the car, but the image is fuzzy. The sentence is dreary because it lacks specificity. The question is: how did the car go? The car went swiftly down the street. The car went wildly down the street. The care went slowly down the street. The car skidded down the street. The car careened down the street. The car chugged down the street. These stronger verbs paint a more vivid picture. Somewhere in the writing process, look at every verb and ask yourself if there is a better option. Can another word do the job with greater vividness, and creativity? If so, consider a verb transplant.